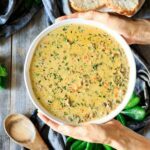 Wild rice soup is an easy recipe to make for dinner. This hearty comfort food is filled with bacon, mushrooms, and vegetables. Use a Dutch oven on your stovetop to create the best creamy soup you’ll have this fall. Melt the butter over medium-high heat in a Dutch oven. Add the mirepoix (onion, celery, and carrot) and the spices and stir until well mixed. Cook for 7 minutes, stirring occasionally, then add the garlic and cook until fragrant, about another minute or two. While the mirepoix is cooking, melt two tablespoons of butter over medium high heat in a medium-sized frying pan. Add the mushrooms, stirring well to coat them in butter, and cook for 10 minutes, stirring occasionally. The mushrooms are done when the liquid is evaporated and they start turning brown. Once the mirepoix is done, reduce the heat to medium and sprinkle the flour on the vegetables. Use a wooden spoon to mix the flour into the vegetables, then cook the flour for 3 minutes. This will form the roux to help thicken the soup. Add the wild rice, and keep stirring for a minute to toast it. Slowly pour in the chicken stock, stirring constantly to prevent lumps. Stir in the water and the crumbled bacon, then cover and bring to a boil. Turn the heat down to medium low and simmer for 45 minutes to cook the wild rice and improve the flavor. During the last 15 minutes of cooking, taste the soup. If desired, add 1/4 to 1/2 teaspoon salt and black pepper and 1 1/2 teaspoons more of fresh thyme leaves. After the soup is cooked, take it off the heat and pour in the heavy cream. Stir until it is well incorporated. Tip: if you are planning on freezing some of this soup, only add cream to the soup you’ll be eating before freezing it. Transfer the soup to individual serving bowls and garnish with a sprinkle of fresh thyme leaves and black pepper. Serve warm. This soup keeps well in the fridge in an airtight container for up to 3 days. If you plan on freezing this soup, it’s best to leave out the dairy and add it once you reheat it. Freeze it in zip-top plastic bags or airtight containers. If you freeze it with the dairy, it could separate. If this happens, whisk it with more fresh cream or a slurry of cornstarch or arrowroot and water. You could also reheat it over a double boiler in its frozen state, stirring frequently.